NETWORK FINALS: THE AMAZING RACE and the rerun of SPEECHLESS gained 0.1 in final numbers, while THE BLACKLIST and SVU lost the same. CABLE HIGHLIGHTS: VH1’s BLACK INK CREW shared the lead in Wednesday cable, despite a 0.11 drop to 0.62. ESPN’s NBA doubleheader was at 0.62 (Knicks vs Boston)/0.42 (Dallas vs. Phoenix). Discovery’s STREET OUTLAWS lost 0.04 to 0.53. On TLC, MY 600-LB LIFE slipped 0.03 to 0.44, and FAMILY BY THE TON ticked down to 0.28. It was a close race in the demo for cable news, with Fox News’s HANNITY ahead at 0.43/0.71/3.9M, MSNBC’s RACHEL MADDOW SHOW at 0.41/0.62/3.2M, and CNN’s ANDERSON COOPER 360 behind at 0.25/0.33/1.1M. On HGTV, PROPERTY BROTHERS rose 0.09 to 0.39, HOUSE HUNTERS ticked down to 0.33, and HOUSE HUNTERS INTL was down 0.07 to 0.28. On ID, HOMICIDE HUNTER dropped 0.04 to 0.36, and SEE NO EVIL was down 0.02 to 0.34. Lifetime’s LITTLE WOMEN: ATLANTA grew by 0.07 to 0.33. On E!, TOTAL DIVAS gained 0.07 to 0.33, and WAGS was at 0.12/0.10, compared to last week’s 0.13. 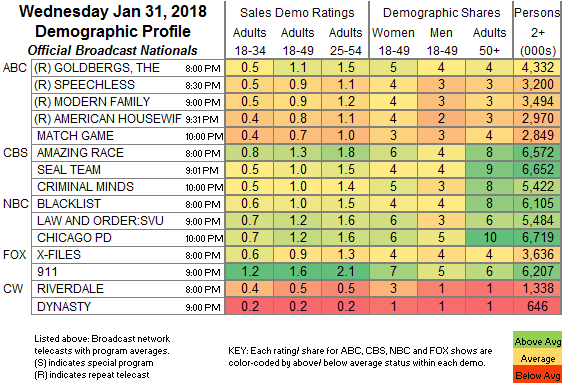 Bravo’s REAL HOUSEWIVES OF NEW JERSEY slumped by 0.14 to 0.31, and RELATIVE SUCCESS ticked down to 0.14. MTV’s CATFISH shrank by 0.13 to 0.26. 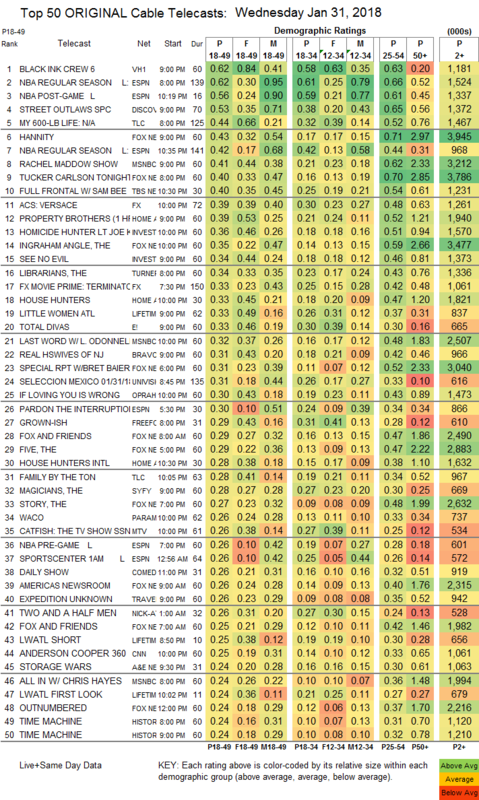 A&E’s STORAGE WARS was at 0.24 compared to last week’s 0.23/0.17, and ROOSTER & BUTCH was down 0.04 to 0.10. Food Network’s GUY’S GROCERY GAMES fell 0.08 to 0.22. TBS’s FULL FRONTAL was the night’s highest rated scripted show, up 0.03 to 0.40. FX’s AMERICAN CRIME STORY: THE ASSASSINATION OF GIANNI VERSACE stabilized with a 0.02 dip to 0.39. TNT’s THE LIBRARIANS climbed 0.06 to 0.34. OWN’s IF LOVING YOU IS WRONG dropped 0.05 to 0.30. On Freeform, GROWN-ISH gained 0.04 to 0.29, and ALONE TOGETHER held at 0.10. On Syfy, THE MAGICIANS climbed 0.06 to 0.28, and the season finale of HAPPY was up 0.02 to 0.19. Paramount’s WACO dropped an uneasy 0.12 to 0.26, and the CMT run was down 0.03 to 0.09. History’s KNIGHTFALL, airing for the first time without a VIKINGS lead-in, edged up 0.02 to 0.22. Comedy Central’s CORPORATE was steady at 0.16. On POP, SCHITT’S CREEK ticked up to 0.09, and LET’S GET PHYSICAL stayed off the chart at 0.03/124K.